DBBL HSC Scholarship Apply Online 2016 starting on 21 August. DBBL HSC Scholarship related all update information available my website http://eduresult24bd.com. Dutch-Bangla Bank Limited (DBBL) within very short time will be published Scholarship program of HSC or equivalent students. Dutch-Bangla Bank Limited announced total scholarship amount this year disbursement one hundred two core taka. This year HSC Scholarship program seventh year. This year that are talented poor student HSC or equivalent pass they can apply this scholarship program. This Scholarship will be given up to the Higher Secondary Certificate (HSC) level of the Education life. Only the Poor but meritorious students can get this Scholarship program are eligible. 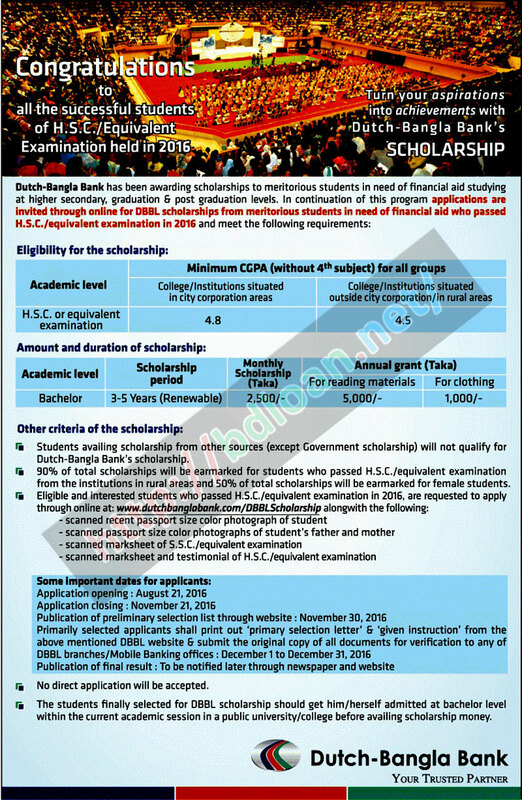 Dutch Bangla Bank HSC Scholarship Result 2016 Preliminary selected list will be published on November 30, 2016. ● Application form are available all DBBL branch, form fill up and four copy passport size photograph, mark sheet with attested by 1st class gradated officer and school head master yearly income certificate. ● Those who are selected for DBBL Scholarship HSC-2016 they must admitted graduation level. Dutch Bangla Bank (DBBL) offered scholarship for HSC/Equivalent 2016 pass students. Applicants must have GPA 4.8 for city corporation area school and GPA 4.50 for others remote city/area students (without 4th subjects) out of GPA 5.00 scale for all groups. Application has to reach DBBL Foundation within 21st November, 2016. Dutch Bangla Bank HSC Scholarship Result 2016.You would get here DBBL HSC Scholarship Apply Online 2016 process, application starts and dead line, application process and instruction’s link, admission related update notice and many more visit this site http://eduresult24bd.